At his downtown Chicago office in Northwestern Memorial Hospital, Dr. Sidle offers many non surgical options for the treatment of facial lines and wrinkles. Dr. Sidle uses his expertise and serves as a national training site to teach other physicians facial anatomy and injetion technique(s) for injectable agents. Dermal fillers or dermal injectables are indicated for the correction of facial lines, wrinkles, and folds to restore volume and fullness to the skin, providing a more youthful appearance. Each dermal filler has its own properties and characteristics as well as optimal performance profile and longevity. Dr. Sidle performs Botox or Dysport, Restylane, Juvederm, Perlane, Radiesse, and Sculptra injections in the office. Lines to the frown, forehead, crow’s feet around the eyes, and vertical lines around the lips occur as the result of repeated facial expressions, sun-exposure, and age. Over time, these lines become etched into the skin. These so-called dynamic lines of facial expression can be treated with an injected medicine, BOTOX or DYSPORT®. This naturally occurring toxin when used in small quantities leads to highly specific relaxation of targeted muscle groups thus eliminating lines which may contribute to a tired, angry, or worried appearance. BOTOX or DYSPORT® is one of the most popular treatments in facial plastic surgery because of its effectiveness, safety, and the fact that there is virtually no down-time. Effective treatment can be accomplished through injections with tiny needles and low volumes, minimizing the amount of discomfort experienced. Because BOTOX or DYSPORT® selectively deactivates only those muscles responsible for creating unsightly lines, there is little risk of affecting a muscle that is needed for function. In addition to improving the appearance of a targeted area, BOTOX or DYSPORT® may decrease the chances of lines forming in the future. Dermal fillers such as PERLANE®, RESTYLANE®, JUVEDERM®, RADIESSE®, and SCULPTRA® are used to add volume to correct moderate to severe facial wrinkles and folds. 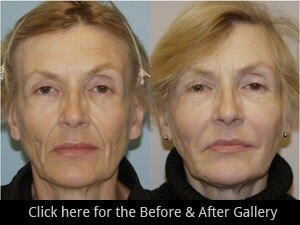 As you age, patients expereince lost of volume to the face along with loss of skin plumpness. Facial injectatbles are used to restore a more youthful appearance in a natural way with little downtime. Facial fillers will correct folds around the nose and mouth, reduce the appearance of smile lines, decrease sagging skin along the jawline, improve depressions under the eyes or from depressed scars, and provide volume and lift to cheeks. Dermal fillers are used in the office under topical numbing cream with the use of special blunt cannulas to decrease discomfort and bruising. Dermal fillers are a rapidly growing, as many patients turn to non surgical choices for facial rejuvenation. The optimal choice in the range of injectable fillers will be individulized just for you at the consultation to achieve the results you desire. Please call today for your one-on-one consultation.